Update: Globe story is here. My friend Amy, whose downtown Chicago high-rise we were fortunate enough to stay in a couple weeks ago, keeps apologizing for the frigid weekend we encountered. I told her we wouldn’t have had it any other way. We needed bragging rights! It had been unseasonably warm there, until we arrived, when it snowed and the days dipped into the 20s and the nights, oh, who wants to think about it. Two things saved us. Amy and her partner, Deanna, keep their heat higher than we keep ours (yay!) and Amy loaned me her shin-length North Face down coat. Yes, yes, oh yes. So, yes, we had a blast –of arctic air, but of fun too. Amy had given us with a travel-writer-worthy list of things to do, plus I had a few story assignments. 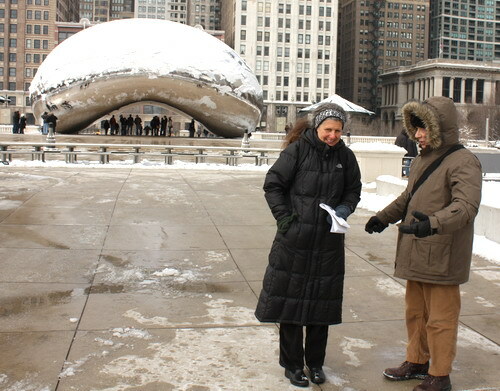 Saturday we met our “greeter,” for my Boston Globe story about the very cool Chicago Greeters program. Greeters are locals who give free tours of their city. 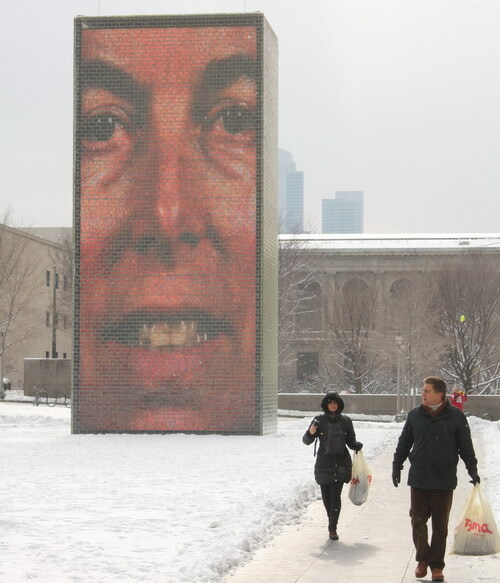 We picked “public art” from a smorgasbord of options. Our guy Larry took us to the beyond-thrilling Millennium Park, and then through a greatest-hits list of sculptures by Picasso, Dubuffet, Chagall, Miro, and Calder. That afternoon Lina and I hopped on the Red Line to Edgewater, where we visited Uncommon Ground, “the greenest restaurant in the country” (according to the Green Restaurant Association) for a little Ode piece I was writing. I’m very skeptical of green claims and usually that proves founded, but not so in this case. 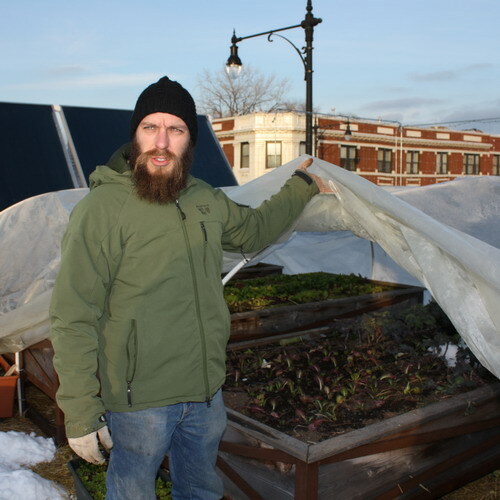 From the organic roof-top farm to the tables made from local fallen trees, and many things in between, this was the real deal. We took Amy’s suggestion (and discount) and headed across the street that night to the venerable Gene Siskel Film Center to see “Newlyweds” starring and directed by Edward Burns. Oh, yeah, and it was followed by a Q&A with Ed himself. Total thrill! Sunday we got lost in the Art Institute of Chicago for hours and hours. In one room we soaked up more masterpieces than many people see in a lifetime. The new (2009) Modern Wing, designed by Renzo Piano, is a soaring three-story beauty chocked with modern, contemporary, and cutting edge show-stoppers. What could top that? 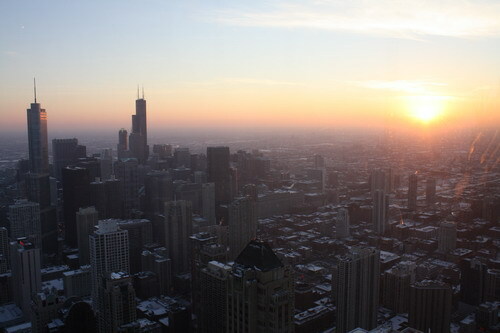 Literally, sunset from the 94th floor of the Hancock Tower Observatory. (We went to the Willis Tower/Sears Tower the next day. 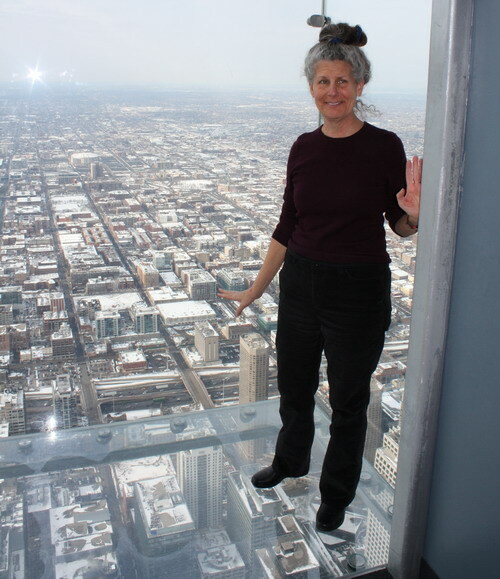 Much longer lines, but it was worth it to stand on the transparent Skydeck Ledge 103 floors above ground.) On the way to meet Dutch friends of Lina’s living nearby, we stopped at American Girl Place for an overdose of pink before returning to adult fun — outstanding brew and food at Revolution Brewing in Logan Square. On our final day, our hosts returned from Florida (oh, did I not mention we had the run of their splashy condo for the weekend?) and Amy and I caught up on some 15 years! Since college, she’s become a city mouse, while I’ve turned into a small-town girl who appreciates the big city from time to time. Thanks for the Midwestern hospitality, Amy and Deanna! We shall return!